If you go to the Hindustan website, you'd be right to say that this pencil doesn't exist. It's not there. A quick search finds the Glow name is now being used for one of their pen offerings. But it DOES exist. And I haven't found any evidence that they're being discontinued. Regardless, I have some in my possession and that's what I'm taking a look at today. Like many of the Hindustan pencils, it seems that they switch around branding so much, I wouldn't be surprised if their website can't keep up, and you may even be able to find these as Apsara Glow sometime in the future. Most of the pencils that sit under the Apsara brand name are usually well made and have really fine paint jobs, a production quality that is excellent. Nataraj, not so much. As I mentioned in my Deep Dark review, that paint job was all over the place and the pencils were all chipped up. That's not the case with the Nataraj Glow box I received. The paint job is immaculate, a lovely shade of metallic gold, close to the gold of the Blackwing 530. Not as thick and pretty, but these also don't cost $25 per box. I think once I finish a 530, I'm going to take the ferrule and hacking one of these. The whole thing is capped off by a light gray stripe that separates the cherry red end dip. It's the same red shade that is on the end of the Apsara Beauty, but a little larger in size, as you can see in the pictures. The pencil imprint is simple: black, saying Nataraj, the a pill with "Glow", then their grading / marketing term "Super Black". The wood is that pitted Jelutong / Vatta / whatever. It's the standard Indian pencil wood that shows up in most of the low- and mid-range lines. Linden and Poplar seem to be reserved for the higher-end pencils. I find it impossible to get a direct word on the name of this wood, some people seem to say it's the same, some say they're different woods and it's one or the other. Just know that it's that pitted wood that is actually really great for pencils, and although it usually shows up in cheap pencils, it sharpens well and, more often than not, results in an unwarped stick. Like most of the Hindustan pencils with this wood and lack of eraser, this feels great in the hand. Very light and balanced. The core is yet another confusing item. The pencil is called Super Black. It's anything but. It's not a light writer, but it's no darker than the HB Hindustan offerings. Other pencils say "Extra Dark" or "Dark Writing". If they don't have a term, they're stamped with HB. I didn't find this one to be harder or softer than the Apsara Beauty "Dark Writing", and it seems lighter than some of the "Extra Dark" pencils, like the Absolute, but darker than the Platinum, also touted as "Extra Dark". This all leads me to believe that the naming conventions are all just a marketing crapshoot, and if you like a core somewhere between a dark HB and a light B, you'll like this one (as well as nearly every other Indian pencil). The core is not super thick like the Absolute, but seems thicker than some of the standard Hindustan offerings. It also occurs to me that the terms may not be a grade of hardness but in graphite quality, fineness of the powder? Not sure if this is an original thought or pulled from pencil nerd discussions over at the Erasable Podcast Facebook Group. Anyway, you should join us over there if you love nerding out about this stuff as much as I do. It's really one of the few reasons I still use Facebook, to be honest. Overall, this is a good one. 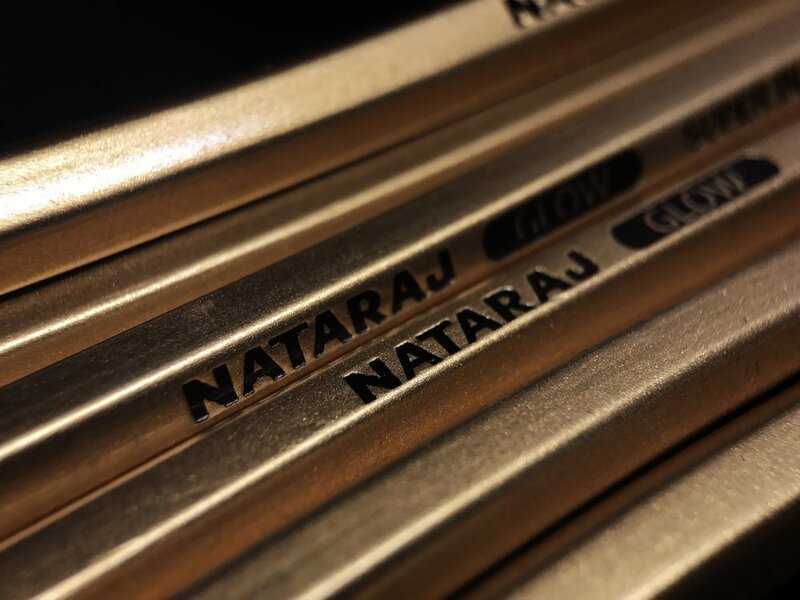 It's got a better paint job than most of the Nataraj-branded Hindustan pencils, and seems to be of a quality they usually reserve for the Apsara line. It's inexpensive, of course, and comes with an eraser and a sharpener in the box of 10. I give this one a recommendation for sure, especially if you like the colors. Available on Amazon, $4.99 for a 10-pack with free eraser and sharpener.